To purchase or not to purchase? To lease or not to lease? Those are questions facilities and radiology groups ask when they want to acquire imaging equipment. So, what's behind their decisions? It's not the type of facility, says Josh Block, president of Block Imaging International, a medical imaging equipment refurbisher based in Holt, Michigan. One might think that one type of facility only purchases, while another type only leases, but imaging centers, hospitals, and radiology practices can go either way on the decision, he says. And, it may not necessarily be linked to one method being more cost-effective than the other over the long term. Some always have considered leasing a more expensive route, including Jessica Montgomery, chief operations officer (COO) for Scottsdale Medical Imaging LTD (SMIL), which operates 14 freestanding imaging facilities in the Phoenix area. "Just like a car, if you lease it, you usually end up paying more in the long run," Montgomery says. Yet, Jim Ambrose, president of GE Capital, Healthcare Financial Services, Equipment Finance, says leasing can be less expensive than purchasing. "If [a lease is] managed properly, the total cost of ownership can be less than an outright purchase," he says. Purchasing often requires a high initial down payment. Often, an organization's access to funds to make that initial payment is the difference between a facility's choice to purchase or lease, says Michael Wendt, senior vice president of imaging and therapy systems at Siemens Healthcare North America, based in Malvern, Pennsylvania. "The more money customers have in hand to spend, the more likely the customers are to plan on purchasing equipment," he says, adding that when capital is less available, customers tend to have greater interest in leasing equipment. Financially sound facilities, Wendt says, are more likely to be bigger operations that have available funds and/or the ability to get a large sum of money at a good interest rate through the bond market. Some facilities, he says, just have more money because they generate it in the course of their operations. Others get a bank loan or ask a vendor to support them. Facilities that purchase equipment like the benefits of ownership, Ambrose explains. "Once paid for, owned assets are often perceived as very profitable to manage," he says. "Some facilities or providers [find that] ownership of their assets—even those prone to technological obsolescence—outweighs the flexibility of maintaining a state-of-the-art equipment portfolio [that leasing may provide], so they often purchase equipment." Ownership has an "obvious advantage" in equipment that has an expected long life, according to financial expert and writer Ed Mann. It also includes tax incentives in the year of purchase and the possibility of depreciation deduction, Mann explained in an article on buying and leasing imaging equipment published online at Atlantis Worldwide (www.atlantisworldwide.com). One example of a large provider that decided to purchase rather than lease imaging equipment is Jefferson University Hospitals in Philadelphia. 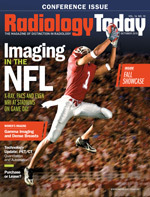 All of the imaging equipment in its radiology department is purchased, says Vijay M. Rao, MD, chair of the department of radiology. The decision, she says, is a corporate one. Rao says the radiology department provides a five-year plan for capital replacement for equipment. "We keep a database of all of our equipment, projecting replacement times depending on the lifespan of the particular equipment. We are now in year three of the five-year plan; at the end of the five years, we will reassess and submit another five-year plan," she explains. As noted, Montgomery also finds purchasing equipment a smarter choice for SMIL, where about 340,000 exams are performed per year across all of their sites, which vary in size and volume of patients seen. "We find that our equipment lasts a long time and is less expensive in the long run to purchase," the COO says. Each equipment purchase is based on the needs of the patients seen at each facility, Montgomery explains. "It's really a multifactorial decision," she says. Among the factors SMIL considers when deciding what modalities to put in each center is the physician specialties that are based at each center. SMIL performs a local market analysis of each site to determine that factor, Montgomery notes. SMIL also takes into account the patient demographics in each surrounding area and the amount of space available where the equipment will be located. "We also make sure we have necessary modalities at centers that are geographically more separated from our other centers," she adds. Leasing, on the other hand, often is utilized by smaller facilities that don't have as much money up front, Wendt explains. "The smaller you are, the more likely you are to lease the piece of equipment directly from the vendor," he explains. Facilities or health care providers that consider the total cost of ownership of their assets often lease equipment, as leases provide payment flexibility, Ambrose states. This flexibility allows payments to be structured to meet cash-flow considerations. Leasing also can be favored because it passes the risk of ownership of assets to the lessor or manufacturer, Ambrose notes. "Leasing may introduce flexibility in managing assets, right-sizing capacity, and driving standardization or utilization based on other environmental factors, such as reimbursement changes or industry consolidation," he adds. Acknowledging the benefits of flexibility, Mann points out that leasing involves less initial expense, has the potential to be tax deductible as an operational expense, and makes it easier to upgrade equipment. Vendors, including Siemens, can tailor a lease to a customer's needs, explains Wendt, noting that leases can be either short or long term. "Whether a capital or operating lease, a monthly payment is funded over the term [commonly 24 to 72 months] and a buy-out option is available at the conclusion of the lease term," Block explains. Lease terms, Block notes, can be a $1 buy-out lease, a 10% buy-out lease, or a fair market value lease. A $1 buy-out lease requires monthly payments and allows the lessee to buy the equipment for $1 when the lease is over, while a 10% buy-out lease allows the lessee to buy the equipment for 10% of its market value when the lease is over, according to the article "Equipment Leasing—The Ultimate Guide" posted on fitsmallbusiness.com. The guide notes that at the end of a fair market value lease, the lessee has the option to purchase the equipment at its fair market value, renew the lease, or return the equipment. Lease buy-out decisions often hinge on the anticipated value and usefulness of the equipment at the end of the lease period. For example, it doesn't make sense to pay more for a low buy-out lease on a scanner you don't expect to keep beyond the lease period. Of course, the tendency to keep equipment longer also affects the lease/purchase decision. • it often includes service coverage. "Generally, lease arrangements are made for larger expenditures and rentals are on mobile equipment either in a trailer or on wheels, such as C-arms, portable X-ray, and ultrasound," Block explains. The downside to renting is that it's more expensive than leasing, he notes. • the high capital outlay isn't feasible for many facilities. The downside to leasing is that it can impact a company's EBITDA (earnings before interest, taxes, depreciation, and amortization), Ambrose says. "It's important to have a good working relationship with a lessor who thoroughly understands the intricacies of the health care market to prevent that," he notes. And, while some facilities may like the opportunity to buy a piece of equipment at the end of a lease, this is not always considered a benefit, Block says. "Purchase options at the end must be both clear and feasible." Recognizing the many factors that go into a purchasing/leasing decision, vendors have taken steps to help their customers make the best choice for their individual establishment. Based on customer requests, Siemens provides two proposals to customers: one that reflects the purchase of a certain piece of imaging equipment, and one that reflects the lease of that same equipment. "We present both of them to our customers and they decide which option works for them," Wendt says. If not offered, making such a request makes sense. The comparison may change from one acquisition to the next. GE makes a model available to customers that helps with financial analysis. "We also have experts in the field in our Healthcare Financial Services Equipment Finance business who work closely with customers to help them better understand technology advancement and other important operational and financial considerations so they can make the best decision for their institution," Ambrose explains. Vendors also can help facilities fund their decision. "We work with the imaging community to provide equipment for purchase or rental and have banking partners who are prepared to fund equipment from X-ray to PET/CT and everything in between," Block explains. Wendt says Siemens also has backed customers' decisions with funding. • use a combination of the above. SMIL has saved a lot of money with a plan that covers some equipment with a service contract and leaves other equipment uncovered. According to Montgomery, SMIL has saved $176,000 per year on US service by "going at risk" on modalities like X-ray and ultrasound, which it considers "low tech" compared with CT, MRI, and PET scanners. "My experience is that the low-tech equipment downtime is significantly less and so is the cost to fix it, so I'm willing to go at risk with it," Montgomery says. "Generally, my X-ray machines have great uptime and when they go down it is less expensive for me to just pay for the time and the part than it is for me to have it on a service contract where I pay thousands of dollars each month and don't need to use it." "More complicated" equipment, such as MRI and CT scanners, is covered with high-level contracts at SMIL, Montgomery notes, adding that the higher you go up the rank of contracts, the more perks you get. Higher level-contracts, she says, can have "higher uptime guarantees, full glass coverage on tubes, emergency and after-hours service if needed, and a certain number of PM [preventive maintenance] visits." Facilities need to keep in mind, however, that the higher up you go, the more expensive the service contract. "That has to play into the decision [facilities make] about their business and service needs," Montgomery says. SMIL's plan is made more efficient, according to Montgomery, because it's supplemented with an equipment management tracking system that allows SMIL to keep on top of the 186 pieces of radiology equipment that are spread throughout its locations. The system, developed by the programmers in SMIL's IT department, shows which pieces are up and running, and which are down, and provides Montgomery with real-time alerts to allow her to run reports when needed. According to the COO, when a technologist at any of the locations has an issue with a piece of equipment, he or she can look the equipment up in the system to secure the manufacturer's name, serial number, make, model, and a service number to call. The system will send updates about the service call and the service provided to all of the people associated with the equipment on both sides. When the equipment is fixed, Montgomery will know through an e-mail. "This helps me get real-time information and as the COO, I need to be apprised of how the operations are working each day, and where we have down time," she says. The system also helps Montgomery track trends with equipment. "I've used this information as a tool to go back to the original equipment manufacturer or to our service organization to show them data of why we may not be happy with a piece of equipment," Montgomery explains. Like many professionals, Montgomery says uptime is very important. "If our equipment is down, we're not able to care for patients and thus are not generating revenue." Jefferson University Hospitals initially serviced its equipment through its own biomedical service department, Rao says, but the department now has a multivendor agreement with Philips Healthcare. "Philips now is responsible for servicing its own equipment, as well as that made by GE and Siemens here," she adds. Facilities also can pay a third-party organization, such as Modern Medical Systems Co (MMS), based in Farmingdale, New York, to service equipment. On its website, MMS provides tips for choosing such a service organization. Those tips encourage facilities to review the organization's reputation, collect references, visit the organization's facility, evaluate its support and other services, and determine its regional presence. Overall, Wendt believes it's in the best interest of the buyer or lessee to keep the vendor involved in one form or another. "I think our customers want to involve us," he says. "They need their staff to be trained, and they have equipment they want to keep updated so that they can provide the best possible health care to their patients."